If the story sounds vaguely familiar—combat by U.S. commandos in African wars that America is technically not fighting—it should. 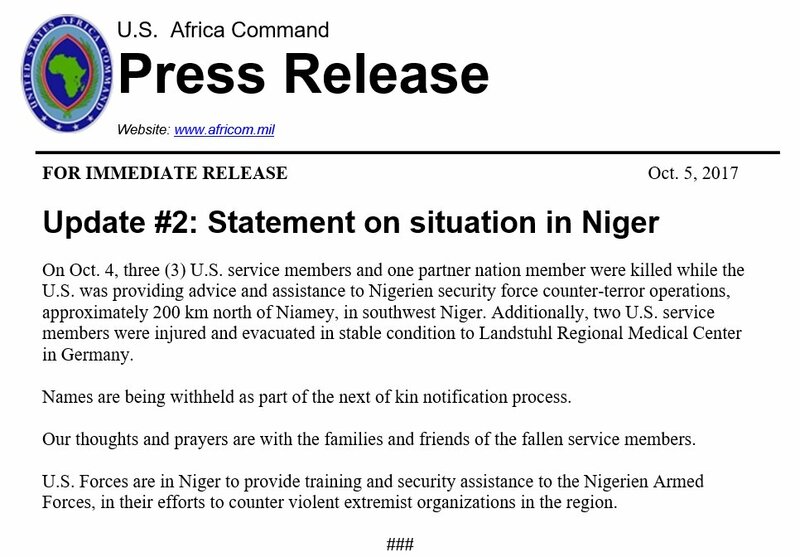 Last December, Green Berets operating alongside local forces in Niger killed 11 Islamic State militants in a firefight. Two months earlier, in October, an ambush by an Islamic State terror group in that same country, where few Americans (including members of Congress) even knew U.S. special operators were stationed, left four U.S. soldiers dead—Green Berets among them. (The military first described that mission as providing “advice and assistance” to local forces, then as a “reconnaissance patrol” as part of a broader “train, advise, and assist” mission, before it was finally exposed as a kill or capture operation.) Last May, a Navy SEAL was killed and two other U.S. personnel were wounded in a raid in Somalia that the Pentagon described as an “advise, assist, and accompany” mission. And a month earlier, a U.S. commando reportedly killed a member of the Lord’s Resistance Army (LRA), a brutal militia that has terrorized parts of Central Africa for decades. Unless they end in disaster, most missions remain in the shadows, unknown to all but a few Americans. And yet last year alone, U.S. commandos deployed to 149 countries—about 75% of the nations on the planet. At the halfway mark of this year, according to figures provided to TomDispatch by U.S. Special Operations Command (USSOCOM or SOCOM), America’s most elite troops have already carried out missions in 133 countries. That’s nearly as many deployments as occurred during the last year of the Obama administration and more than double those of the final days of George W. Bush’s White House. While most missions involve training, instruction, or war games, Special Forces soldiers are also regularly involved in combat operations across America’s expansive global war zones. A month after Flintlock, for example, Green Berets accompanied local commandos on a nighttime air assault raid in Nangarhar province, Afghanistan, during which a senior ISIS operative was reportedly “eliminated.” In May, a post-deployment awards ceremony for members of the 2nd Battalion, 10th Special Forces Group, who had just returned from six months advising and assisting Afghan commandos, offered some indication of the kinds of missions being undertaken in that country. Those Green Berets received more than 60 decorations for valor—including 20 Bronze Star Medals and four Silver Star Medals (the third-highest military combat decoration). Air Force Special Operations Command, which fields a force of 19,500 active, reserve, and civilian personnel, conducted 78 joint-training exercises and events with partner nations in 2017, according to Lieutenant General Marshall Webb, chief of Air Force Special Operations Command. In February, for example, Air Force commandos conducted Arctic training—ski maneuvers and free-fall air operations—in Sweden, but such training missions are only part of the story. Air Force special operators were, for instance, recently deployed to aid the attempt to rescue 12 boys and their soccer coach trapped deep inside a cave in Thailand. The Air Force also has three active duty special operations wings assigned to Air Force Special Operations Command, including the 24th Special Operations Wing, a “special tactics” unit that integrates air and ground forces for “precision-strike” and personnel-recovery missions. At a change of command ceremony in March, it was noted that its personnel had conducted almost 2,900 combat missions over the last two years. For years, U.S. Special Operations forces have been in a state of seemingly unrestrained expansion. Nowhere has that been more evident than in Africa. In 2006, just 1% of all American commandos deployed overseas were operating on that continent. By 2016, that number had jumped above 17%. By then, there were more special operations personnel devoted to Africa—1,700 special operators spread out across 20 countries—than anywhere else except the Middle East. Recently, however, the New York Times reported that a “sweeping Pentagon review” of special ops missions on that continent may soon result in drastic cuts in the number of commandos operating there. (“We do not comment on what tasks the secretary of defense or chairman of the Joint Chiefs of Staff may or may not have given USSOCOM,” spokesman Ken McGraw told me when I inquired about the review.) U.S. Africa Command has apparently been asked to consider what effect cutting commandos there by 25% over 18 months and 50% over three years would have on its counterterrorism missions. In the end, only about 700 elite troops—roughly the same number as were stationed in Africa in 2014—would be left there. Substituting forces in this way is precisely what Iowa Senator Joni Ernst, an Iraq War veteran and member of the Armed Services Committee, has also been advocating. Late last year, in fact, her press secretary, Leigh Claffey, told TomDispatch that the senator believed “instead of such heavy reliance on Special Forces, we should also be engaging our conventional forces to take over missions when appropriate, as well as turning over operations to capable indigenous forces.” Chances are that U.S. commandos will continue carrying out their shadowy Section 127e raids alongside local forces across the African continent while leaving more conventional training and advising tasks to rank-and-file troops. In other words, the number of commandos in Africa may be cut, but the total number of American troops may not—with covert combat operations possibly continuing at the present pace. “USSOCOM continues to recruit, assess, and select the very best. We then train and empower our teammates to solve the most daunting national security problems,” SOCOM commander General Thomas told the House Subcommittee on Emerging Threats and Capabilities earlier this year. Why Green Berets and Navy SEALs need to solve national security problems—strategic issues that ought to be addressed by policymakers—is a question that has long gone unanswered. It may be one of the reasons why, since Green Berets “liberated” Afghanistan in 2001, the United States has been involved in combat there and, as the years have passed, a plethora of other forever-war fronts including Cameroon, Iraq, Kenya, Libya, Mauritania, Mali, Niger, the Philippines, Somalia, Syria, Tunisia, and Yemen.